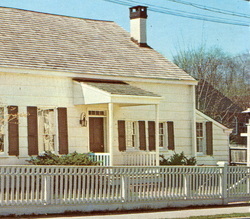 The Earle-Wightman House at 20 Summit Street is owned by the Town of Oyster Bay and was operated by the Oyster Bay Historical Society as its headquarters, research library, and museum before the opening of the Angela Koenig Research and Collection Center in February 2011. The Society, a nonprofit organization, was founded in 1960 with the singular purpose of preserving the history of the Oyster Bay community. Originally built on South Street around 1720 as a small, one-room dwelling, the house grew over the next 150 years to its current size. During that time the house had several owners. As the 19th century began, two successive Baptist ministers, the Reverend Marmaduke Earle and the Reverend Charles S. Wightman (after whom the house is named), made their home here. In 1966 the house was donated to the Town for the Society's use by Bruce Wood Hall and was moved to Summit Street. The house's first floor is open to the public for viewing of its Colonial Room, Minister's Parlor, 1940s Kitchen, gift shop, and beginning in November 2016, a gallery of rotating exhibitions on Oyster Bay's social and cultural history. The whole fabric of the Town's fascinating history from colonial times to the present is interpreted by the Oyster Bay Historical Society at our historic Earle-Wightman House and the Angela Koenig Center. 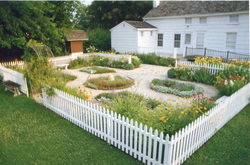 Through the efforts of the North Country Garden Club, the grounds of the Earle-Wightman House have become the setting for an18th century garden which serves as a sanctuary from 21st-century stress and noise while providing visitors with an historically accurate presentation of how such a garden would have looked over two hundred years ago. Like many gardens of the period, it features not only ornamental plantings but also herbs used for medicinal purposes, cooking, or fragrances.